5 Dinners, 5 Ingredients, for Under $5 Each! Today I want to share my 5 dinners, which take 5 ingredients or less, all for under $5 per meal! Each of these recipes serve a four person family. To increase the nutritional value of the dinner, simply add a simple salad to each meal! While rice is cooking, mash salmon in a medium sized bowl. Season salmon mixture with salt, pepper, and/or other seasonings (optional). 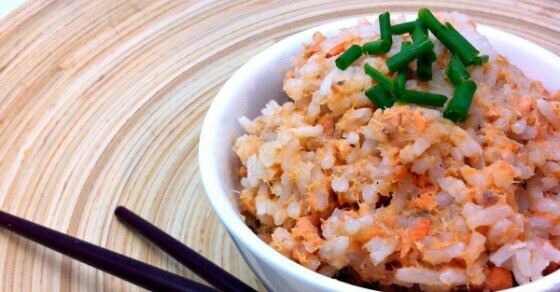 Once rice is cooked, combine the rice with salmon mixture. Serve with soy sauce and top with chopped green onion or cucumber (optional). Place chickpeas into a skillet and cover with water. Mix in minced garlic, brown sugar, and curry powder. Cook until chickpeas are tender. Mix everything into a large pot. Simmer until beans are tender. Prepare angel hair pasta as directed on the box. Warm the olive oil over medium heat. Saute the minced garlic until softened (don’t wait for it to turn brown or it will overcook). Pour garlic/oil mixture over strained pasta. 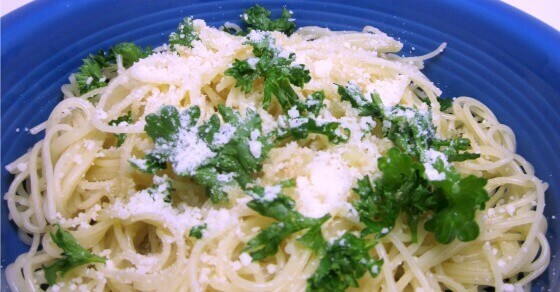 Scoop onto plates and sprinkle freshly grated Parmesan cheese over top. Mix tuna, mayonnaise, cucumber, salt and pepper into a large bowl. Spoon into the middle of a tortilla. I’ve included a free downloadable grocery list for these 5 recipes. All you have to do is click the download button below. 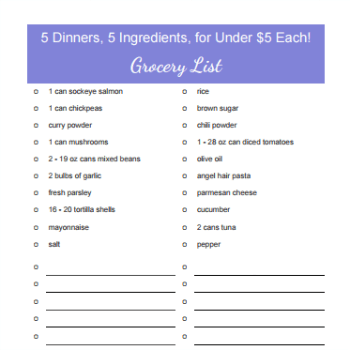 Check out this handy grocery list to make 5 dinners for $5 or less (each)! Download your grocery list today! I invite you to share in the comments, do you have any quick, inexpensive meals which use less than 5 ingredients? Then share this article with any friends who might need some new meal ideas! Well, you’re in luck I guess because these recipes are so simple – making any of them is a breeze! Ooh, a tuna wrap! So easy and I’ve never had one. The salmon rice would be my first choice. And oh how I love easy vegetarian chili! Tuna wraps are actually my hubby’s brainwave – so easy and so good. Plus it’s flexible – you can throw any random veggie in them and they taste great! I love our salmon rice recipe – the kiddos go crazy over it too. I love all of these recipes Jennifer and truthfully I have never made any of them. They look easy and delicious and something that both the adults and kids in our family would like. Wow, thank you! Pinned and shared! Thanks for pinning and sharing! Muchly appreciated – I hope you enjoy these quick, inexpensive, and savory meals! Most of our meals are less than 5 ingredients. We don’t have time to get fancy every evening. I should try the salmon rice. Super easy. And we do chicken roll ups. Yummy! The salmon rice is SOOOO good and my kids love it! Chicken roll ups sound yummy – I may have to try that out soon. That capellini looks delicious. We love fresh garlic at my house. Pinned. 5 ingredients or less are my kind of meals :). I’m really trying to cook more. We eat out way too much. Thanks, Jennifer! Yes, eating out can be a huge strain on the budget. These meals are so quick to whip up and are so affordable. I like to have a rotation of meals like this because it keeps our grocery budget down. Thanks for sharing your thoughts on this Candace! I’m on vacation and doing my blog reading today and I have to say that I love this! I don’t meal plan and just wing it but sometimes there are times when I need something more and this list would be great, especially for the times when I don’t have a lot of time on my hands. It’s so helpful to have a list of quick and simple go-to meals. Most of these can be whipped up with common items found in your pantry too! Oooh, Jennifer, I love this idea. I’m going to have to try some of these recipes for myself. Top on my list is the roti. We do roti differently in the Caribbean and I’d love to give yours a try. Sounds yummy! I’m delighted you enjoyed this Marva! The roti is a recipe that my parents used to make when I was a little girl – it’s kind of sweet so my kids love it – I would be curious to know what’s in your roti. Thank you Jennifer always on the hunt for easy and non-expensive meals to make. I always seem to get into a meal planning rut. Pinned this one to my Recipes board. I’m delighted you enjoyed this Bonnie. I’m also always on the look out for quick, easy, and inexpensive meals to make. I hope you enjoy these dishes. Thanks for pinning! These are awesome simple recipes. I could even make some of them vegan but substituting the mayo for EVOO (or even better oat/nut milk and cashews.) Happy Monday. Oh you could definitely make vegan versions of these Caryn! I love simple, quick recipes! They save me on my busy weeks! Yay! I’m delighted you’re excited about these recipes! They are menu staples around here and all of them are DELICIOUS! Thanks for pinning Katie! I appreciate it!